The Storytellers course was organized by FICA in collaboration with Serendipity Arts Foundation following ‘The Moving Image: A Course Exploring Light, Movement and Narrative’, 2017. It began on September 10, 2018 with an orientation session with Lokesh Khodke, Course Facilitator and Vidya Shivadas, Director of FICA. It ran from September 10 – October 24, 2018 with modules covering zines, comics and video. Titled ‘The Storytellers: A Course exploring Zines, Comics and Video’, this intensive programme was now directed towards the medium of graphic narrative and its various possibilities of creation. It intended to engage with art practices that have histories of working outside the confines of the art gallery or related sanctioned ‘white cube’ spaces, seeking more direct and immediate contact with their audiences. Of particular interest to us were the ways artists are currently re-addressing and exploring the richness of audio-visual and graphic story as a self-sustained practice. It was therefore designed to explore multiple layers of visual storytelling and these mediums through three modules on video art, comics/graphic narrative and zines. Each module was five-days in duration and explored multiple possibilities of visual storytelling through fiction/non fiction, news as well as intimate stories from the participants’ own lives and observations. A group comprising 14 participants- Akshay Sethi, Tilottama Bhowmick, Khandakar Ohida, Priyesh Gothwal, Ankit Ravani, Yogesh Ramakrishna, Zeel Sanghvi, Maya Janine D’Costa, Pavithra R, Rahul Kamalasan, Rohit Kumar, Sana Bansal, Vikrant Kano and Tahsin Akhtar- was immersed in a month-long intensive process experimenting with zine-making, graphic narratives and video. The first week of The Storytellers course focused on zine-making and was titled ‘z is for zines’. Conducted by Himanshu S of the Bombay Underground collective, the module introduced the participants to the various facets of zine-making, publishing and distribution politics. As an extension of this discussion, the participants went out on the streets to hustle and sell zines of Bombay Underground. Covering different locations including Connaught Place, PVR Cinemas (Saket) and Hauz Khas, the participants displayed and hustled the zines using tactics they deemed right for the location and its constitutive public. The 5-day module also included a trip to the Faridabad Majdoor Samachar (Faridabad Workers’ News). Founded and edited by Sher Singh, FMS is a monthly workers’ newspaper published from the Majdoor Library, Autopin Jhuggi, Faridabad since 1982. The second week of The Storytellers course had graphic novelist Sajad Malik conduct sessions on his craft with the participants. Following the discussions, Malik introduced the concept of the ‘storyboard’ to the participants. As part of the exercise, he asked each one of them to pen down an intimate story (fictional or otherwise) with a conscious effort to avoid jargon, judgment and abstraction. 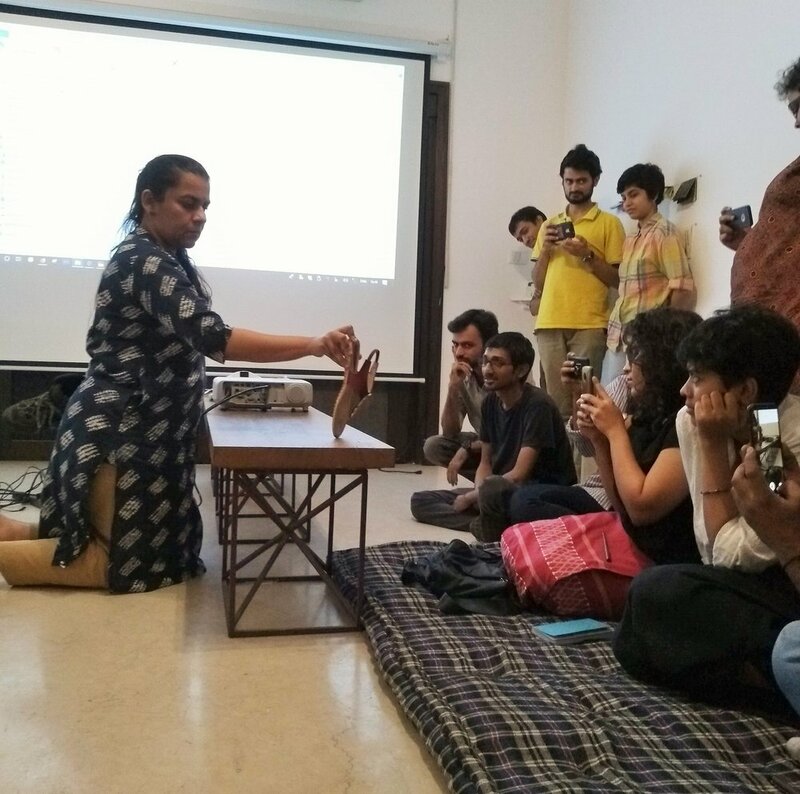 The week also had evening lectures by artists Bhagwati Prasad and Vidyun Sabhaney who used their own bodies of practice to initiate the participants into the craft and familiarise them with the process of making and the afterlife of the narrative in print. The third week of The Storytellers course came to a close with filmmaker Sameera Jain’s module on video. Focusing on the differences and overlaps between textual and non-textual channels of expression, Sameera discussed the indexical nature of the image and how it shapes perception on the viewer’s end. The module also had guest speakers Ruchika Negi and Nayantara Gupta over for lectures on their respective fields of practice. Prof. Gupta especially introduced the participants to the history of the Defence Colony neighbourhood using interesting anecdotes and old maps of the city, which the participants used to subsequently navigate their own trajectories around the area while making videos. The course culminated in an Open Studio organised on October 14, which provided a platform for the participants to share some of the processes and outcomes of the programme with everyone. On October 17, we had puppeteer and puppet designer/director Anurupa Roy grace our space. Through a presentation that traced the history of the art of puppetry in India as well as her own body of work as developed through the Katkatha Puppet Arts Trust, Anurupa initiated an engaging conversation around questions of reality, unreality, anthropomorphizing the inanimate and the very material art of making the puppets by hand. On October 19, 2018, we had comic artists, Shivangi Singh, Gaurav Sharma, Ishita Sharma and Rai come to our studio space and exchange notes with the participants of The Storytellers course. Each of them conducted short sessions with the participants about their own bodies of practice as they were developed during the Non-Fiction Comics Workshop with artist Orijit Sen in Kochi from July-August, 2018. 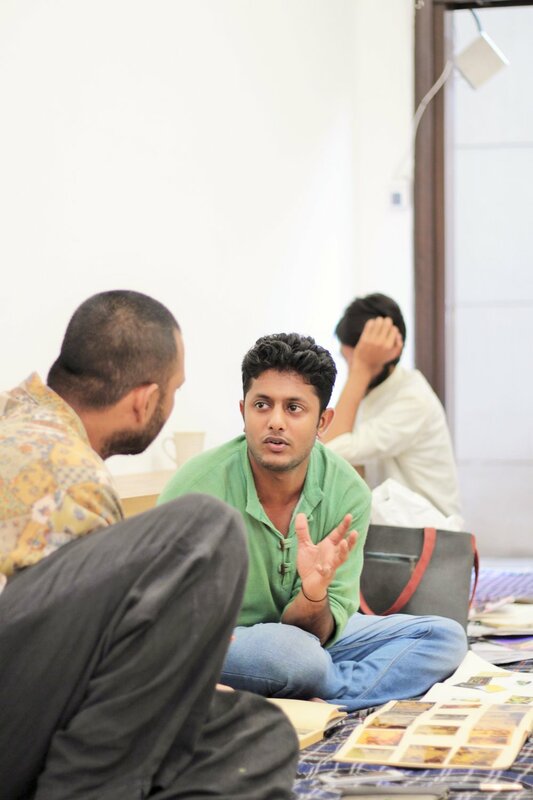 This was followed by a short session with artist and co-founder of the Raqs Media Collective, Shuddhabrata Sengupta. Beginning with the concept of a ‘story’ and the many ways of ‘telling’ it, Shuddhabrata veered into anecdotes to delve deep into how storytelling as a mode and medium constitutes the essence of our histories. For SAF and FICA, the course has been an invaluable experience in terms of building a curriculum from the inputs of practicing artists and to provide the group of young practitioners a chance to explore ideas, techniques and mediums that they would have not had access to within the formal art college programmes. It has been a very rich set of inputs the group has received and we really look forward to seeing how these young practitioners take these forward in their own bodies of practice. Serendipity Arts Foundation (SAF) is an arts and cultural development trust created to encourage and support the arts as a significant contributor to civil society. SAT aims to promote new creative strategies, artistic interventions, and cultural partnerships which are responsive and seek to address the social, cultural and environmental milieu. Committed to innovation, SAT intends to support, promote and create platforms for innovation and creativity providing the wider public with a unique cultural and historical source of modern contemporary art and culture. SAT programs are designed and initiated through innovative collaborations with partners across a multitude of fields, each intervention created using the arts to impact education, social initiatives, community development programmes, explore interdisciplinarity between the arts, and to better understand the shared histories of the sub-continent. For more information about the modules, follow The Storytellers blog.